Common bean is the most consumed grain legume and provides up to 15% of total daily calories and 36% of total daily proteins in different regions of Africa and the Americas. Moreover, the inclusion in the diet of common bean reduces risk of obesity, diabetes, cardiovascular diseases, and different types of cancer, due to the presence of different beneficial compounds. However, common bean proteins are not well balanced in amino acid composition, containing a low amount of sulfur amino acids, and some of them, such as lectins, are toxic. Moreover, the relatively high amount of iron present in the seed is poorly bioavailable mainly due to the presence of phytate. All these aspects reduce common bean nutritional value. 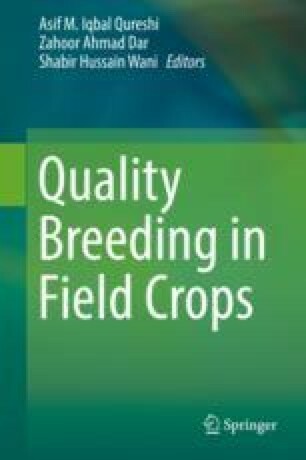 Screening natural and induced biodiversity for useful traits, followed by breeding, is a way to improve nutritional quality. In the last decades this approach was undertaken to improve seed protein quality and to increase iron content and bioavailability from this staple crop. We kindly acknowledge Dr. Roberto Bollini for critical reading of the chapter. Prasai N, Asare-Marfo D (2015) Biofortification Priority Index: a global strategy tool for investing in crop biofortification. http://www.harvestplus.org/knowledge-market/BPI.